Prepare beets by peeling and roughly chopping. Place them on a foil lined pan and bake for 40 minutes in a 375 degree oven. 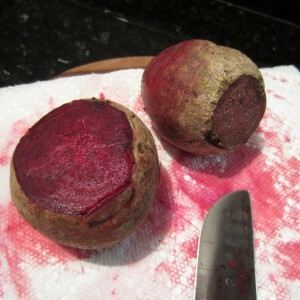 Tip: Beets juice will stain. I use a wooden cutting board covered with paper towels when cutting the beets. If you wash your hands and utensils immediately, most of juice stains will come off. 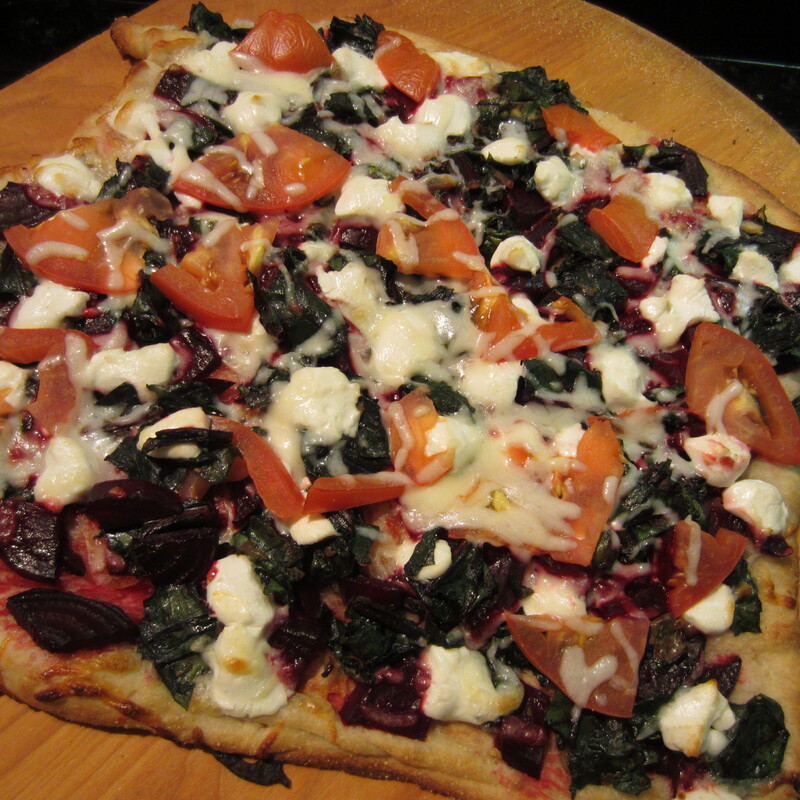 Reserve the beet greens. Wash and trim the stems and roughly chop into bite size portions. Select only the tender portions of the greens. In a skillet heat (over medium heat) 1 tablespoon of basil flavored olive oil. Add greens, shallot and garlic.Stir with spatula and cook until the greens begin to wilt. Add salt and pepper. Cover skillet and continue cooking over low heat for 4-5 minutes. Remove from heat and set aside. Prepare the pizza dough as directed on the package. If using a pizza peel and baking stone spread cornmeal onto the pizza peel. Unfold the dough onto the peel. If the dough tears, don’t worry. Just smooth and patch. 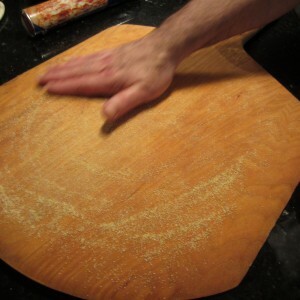 A traditional pizza pan can also be used. 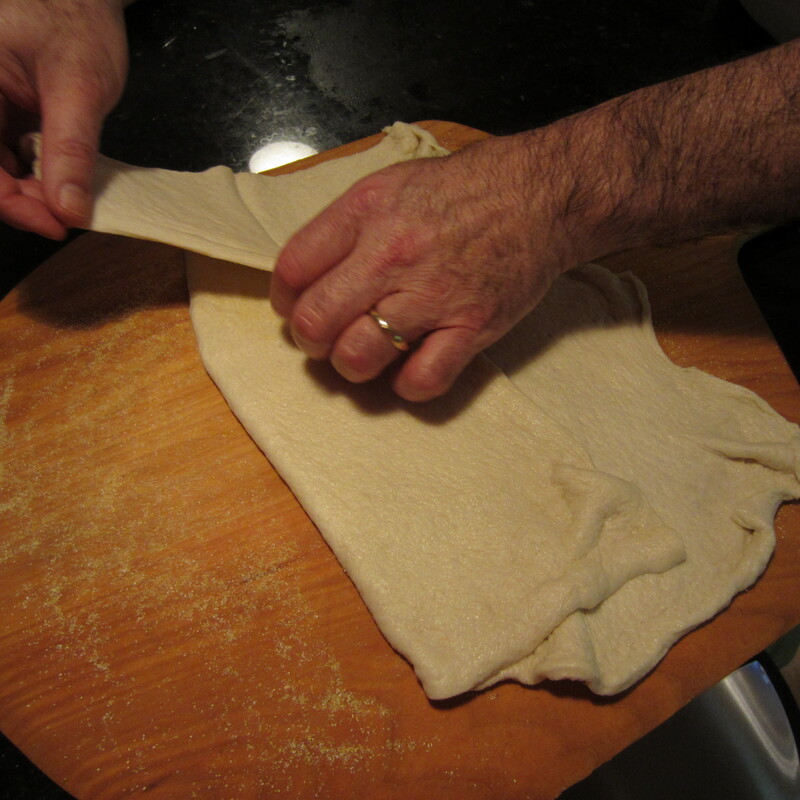 Dust with cornmeal and spread out the dough to fit the pan. Preheat oven to 400 degrees. Brush the pizza crust with basil olive oil. 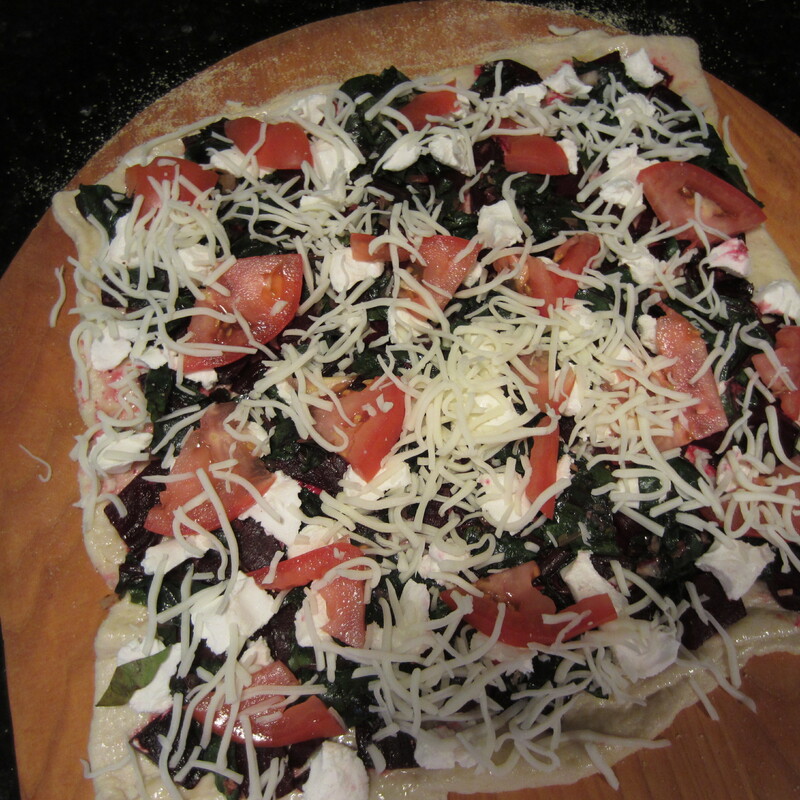 Evenly arrange roasted beet pieces and beet green mixture onto pizza dough. 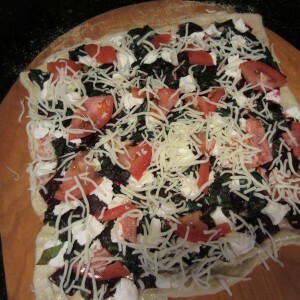 Sprinkle evenly with crumbled goat cheese. 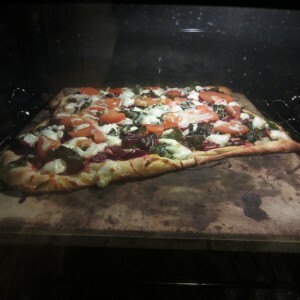 Top with slice tomatoes and evenly distribute the mozarella cheese. 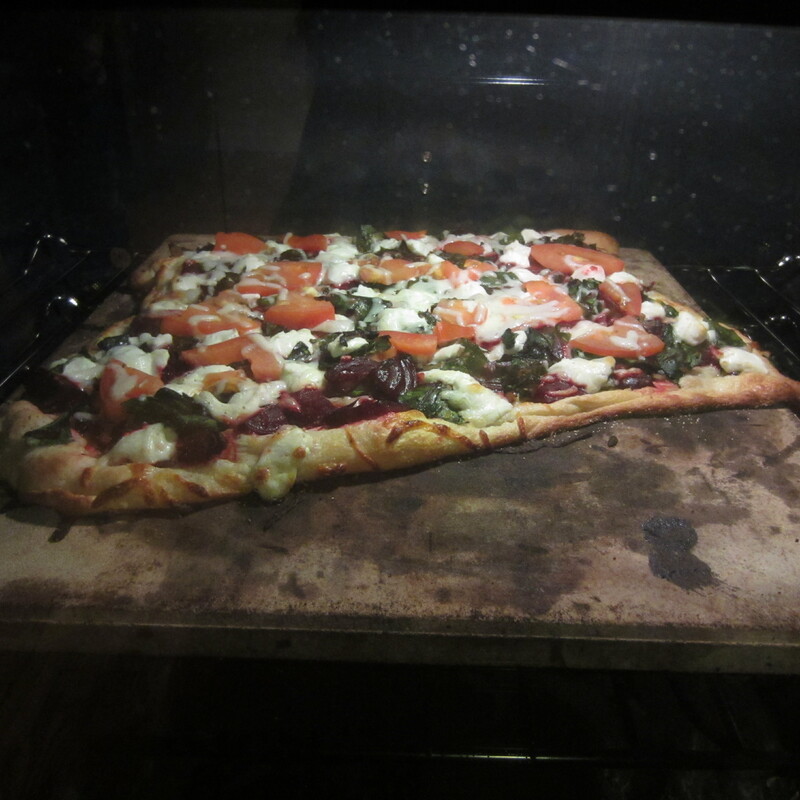 Bake for 10-15 minutes, until crust and goat cheese is turning a golden brown. Remove from oven and cool slightly before cutting into slices. Yields 8 pieces. Each slice is in the neighborhood of 298 calories (these are fairly generous slices). Tip: You can knock 15 calories off each serving if you elect to use non-stick cooking spray in the skillet when cooking greens mixture.